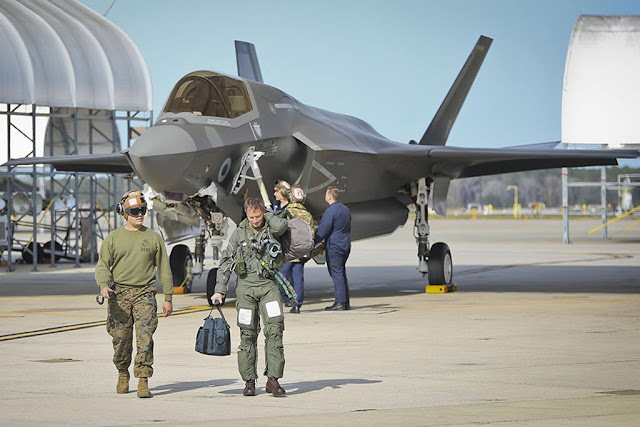 The UK has taken delivery of its 14th F-35B Lightning II which flew into Beaufort, South Carolina last week to take its place as part of the Lightning Fleet, set to operate from Queen Elizabeth class aircraft carriers and RAF Marham. The UK has taken delivery of its 14th F-35B Lightning II which flew into Beaufort, South Carolina last week. Crown copyright. Operated jointly by the Royal Navy and Royal Air Force, the F-35 Lightning jets will be able to operate on land or embarked on the UK’s new aircraft carriers. This delivery is a significant milestone for the Lightning Programme and in particular, alongside the formal commissioning of the HMS Queen Elizabeth Carrier into the Royal Navy earlier this month, demonstrates the advancement towards the establishment of the UK’s Carrier Enabled Power Projection capability. There are currently some 200 British personnel based at Beaufort testing the aircraft and getting them ready to arrive in the UK next summer as 617 Squadron. Preparations are also being made for First of Class Flight Trials, due to take place on HMS Queen Elizabeth later next year. The programme is on schedule to achieve Initial Operating Capability from land next year with Initial Operating Capability Carrier Strike in 2020. In 2018, the aircraft – along with the Navy and RAF pilots and ground crew – will arrive in the UK to officially stand up at RAF Marham in Norfolk. RAF Marham will be the Main Operating Base for the Lightning Force in the UK and from here, they will deploy forward to either embark on-board our Queen Elizabeth Class aircraft carriers, or operate from Deployed Operating Bases. Following successful trials on the land based ski-ramp design which is featured on the UK flagship, and with the RAF Marham runway infrastructure completed as part of a £250m major investment programme in preparation for the F-35 arrival, Defence Minister Harriett Baldwin earlier this year announced that the F-35 was cleared for take-off. As the only level one partner on the F-35 programme, the UK has been working closely with the US from the outset. UK industry will provide approximately 15% by value of each F-35 to be built, which are due to total more than 3000 in number. The programme has already generated $12.9Bn worth of orders for the UK and at peak production the programme will support over 24,000 jobs in the UK.